As more and more players come into contact with Exotic weapons the ultimate question arises - which Exotic weapon is the best? Most would agree that primary exotic weapons are desirable but Heavy Exotics could be the most fun. 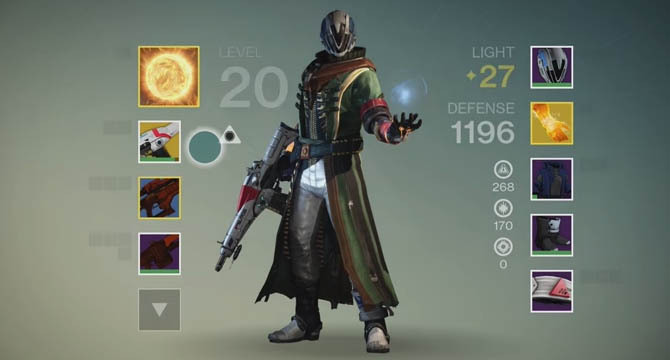 So which Exotic weapon is the best overall? We all know that Strange Coins are a highly sort after commodity in Destiny so making the right choice when purchasing from Xur is a delicate balancing act. Should you buy now or wait another week for something better? Without some kind of insider knowledge it's hard to know if dishing out 20 or so coins is a worthwhile investment. It was only last week that Xur came along with the nice surprise of selling Suros Regime - the ultimate Auto Rifle that everyone lusted after. Auto Rifles are way too OP in Destiny already so add in some Exotic benefits and that gun was sure to sell out quickly. If you spent your coins on that baby then you've done yourself proud. 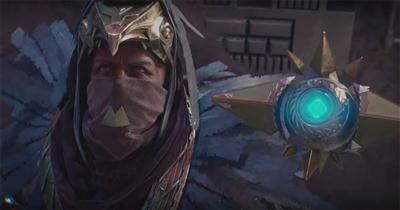 But don't think that Suros wins outright though because the Vex Mythoclast has also been on everyone's mind recently. Not only because of its rarity (found only during Raids) but also because of its awesome power that can be unleashed with zero charge time. 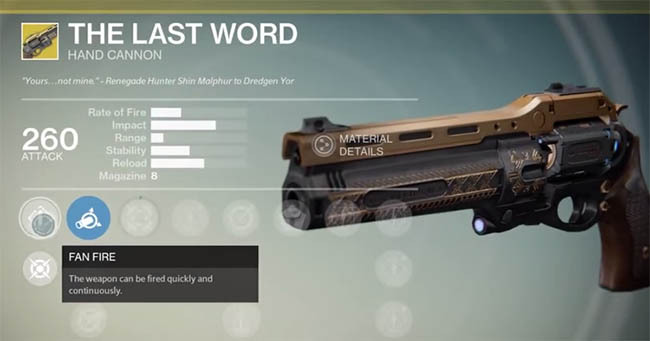 An under-appreciated Exotic weapon, The Last Word is a fully automatic Hand Cannon with a high damage rating. I got The Last Word from a Purple Engram exchange with the Cryptarch even before the patch came out. The weapons range is the limiting factor here, putting you in danger as you try and confront enemies at close range. It's the opposite of your Ice Breaker or Patience and Time where long range vantage points are beneficial. Its full auto mode means you can unleash an entire clip of Hand Canoon ammo in a short space of time, usually killing off whatever you're after quite quickly. After a few upgrades, you can unlock the Hip Fire upgrade which grants bonus accuracy when the gun is fired from the hip. With this perk activated you can stay on the move and still unleash those damaging rounds without worrying about accuracy. I really like The Last Word because you feel truly overpowered and at the heart of the fight. If used in combination with a Titan melee attack and Super, you can brute force your way through most situations with the Hand Cannon by your side. The biggest downside to this weapon is its slow reload time. Pocket Infinity can be acquired in a number of ways but the most common is from one of the Exotic Bounties that you get when you hand in another bounty. The Bounty requires you to dismantle enough Rare Fusion Rifles and rack up the kills and it's yours. Although the weapon has a slow charge rate, once fully charged the weapon unleashes a constant stream of lazers giving no hope to anything in its path. This is amazing in both PvE and PvP when you can predict enemy movement and quickly peek round the corner and destroy anything in the room. You do require a perk upgrade to give the weapon more stability though which can be quite unpredictable when you first get it. 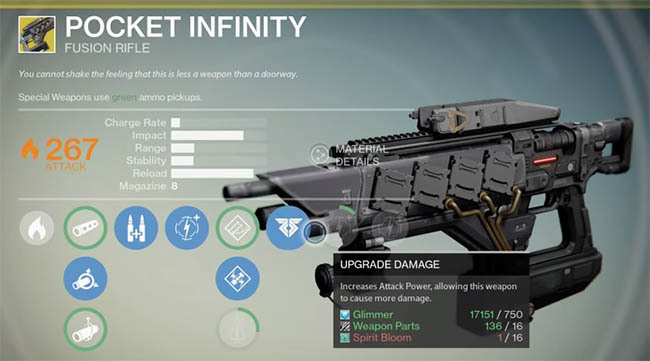 It's worth noting that Pocket Infinity is a Special weapon, unlike Vex which occupies the Primary slot. It's major downside is the slow charge rate which only works in the right situations. Note: - Bungie reduced the magazine size for this weapon soon after launch, making it all but useless compared to other fusion rifles. Imagine a Sniper Rifle that auto reloads? Well that's Ice Breaker in a nutshell. Thanks to its extreme range and high impact you can simply setup camp and take out players in PvP or bosses in PvE. Every 6 seconds a new shot is added to the clip so although you can't reload the weapon it doesn't matter when infinite ammo is on offer. Even if the magazine empties out, simply switch back to your primary for a bit and hey presto your Ice Breaker is fully reloaded ready to go. Two of its upgrades offer the chance to get ammo back from missed shots and also the chance to explode enemies on impact. The exploding feature is not as good as it sounds unfortunately. The weapon is very powerful and makes for the perfect companion on Nightfall and Raids where enemy health is considerably higher. I found I could do 3K damage to larger enemies and wipe out most Captains in seconds. I also found that Ice Breaker is invaluable on missions where ammo drops are disabled and you can't pick up that extra ammo. The main downside to Ice Breaker is you spawn with zero ammo which can slow you down after revives and when you want to move through a Strike quickly. It also has high recoil which makes your first shot even more important because the follow up is nearly impossible before the target moves away. This exotic auto rifle is a well-balanced weapon offering an exotic bonus that the bottom half of the clip deals bonus damage and healing powers. It recently swarmed PvP matches after everyone spent their Strange Coins on it when Xur arrived at the tower. Compared to other Exotic weapons its weakness isn't really noticeable. It's supposed to have a slow rate of fire but is well compensated by the bonus damage and healing abilities. In general Auto Rifles have incredibly good range, stability and make for versatile weapons. This Exotic is also a primary weapon meaning you've got more time to enjoy it thanks to an abundance of ammo in both PvP and PvE. The bad news is that Auto Rifles are in for a big NERF soon which will probably put the Suros well down this list. So keep enjoying it while you can! A Solar Exotic weapon, the Mythoclast is the same weapon you see those annoying Vex enemies using in PvE. Currently, the weapon is considered the best weapon in the game because of its immense power, zero charge time and long range. There's also hardly any kick back on the Mythoclast giving you time to fire off several rounds without the need to readjust. The Vex has a huge advantage over other Fusion Rifles in that it's treated as a Primary Weapon in the game. This makes the Vex Mythoclast more of a Scout Rifle/Fusion Rifle hybrid which as you can imagine is an incredibly powerful combination. If you stack all those advantages up you can see that the Mythoclast was a mistake from Bungie. It should have been a Special class weapon because as a primary it's too dam good! The weapon is highly sort after largely because the most reliable way to acquire one is by beating the Vault of Glass on Hard. This can take many hours of hard work and reliable teammates. Caution: I wouldn't be surprised if the Vex also suffered a similar fate to auto rifles and got nerfed in the near future. Note 2014: It was nerfed, although still a great weapon.